By most people’s standards, and for lots of reasons, it’s been a tough start to the year for LGB Brass. So we toddled off to Stevenage on Sunday 17th March for the London and Southern Counties Area Contest with mixed feelings. The piece (Darrol Barry’s Rise of the Phoenix) hadn’t sparked too much a flame for most of us and after a few challenging months, many us were keen to get the contest done and move on (and play something else for a bit!). Somehow, we managed to draw number one again (that’s the third contest in a row where we’ve played the National Anthem, and we’re getting a bit bored of it now) – so there wasn’t even time to nip to Spoonies for breakfast before we were on stage and giving the Phoenix our best for one last time*. Fair to say it didn’t go entirely to plan. The down side of playing first is that you then have the day to kill in Stevenage. Fortunately someone had seen fit to lay on a Rock Choir in the town centre, so with the aid of this and one or two of the local hostelries the hours flew by and we were back in the hall for the results. The band placed fifth, which we were pretty proud of (and possibly a little surprised by). 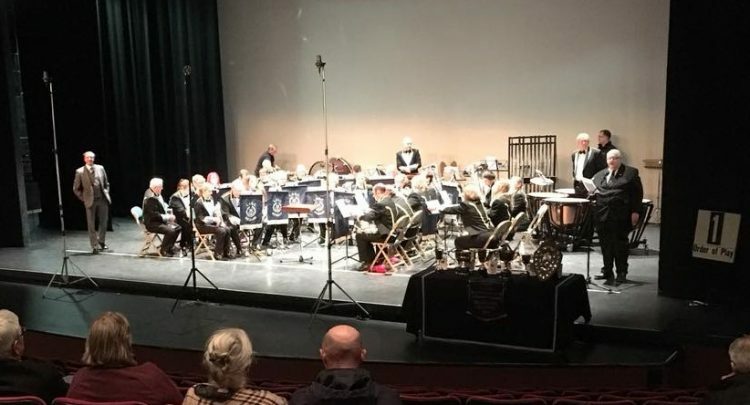 Congratulations are due to our Sussex friends at Horsham Borough Band, who placed just above us in fourth place in the second section (and also won promotion back to the first section), and Chichester City, who took the third section prize. Most impressively of all however, our MD’s band Friary secured a remarkable fifth successive Championship title. Well done guys – and good luck at the Albert Hall in October! *The photo is of last year’s trip to Stevenage – so technically this is ‘fake news’. Someone had convinced the usual photographer to sit on 3rd cornet, so we had to get creative.